Figure 1. In A, the droplets are situated in a non-viscous environement and in B they have a higher viscosity. Bacteria are incredibly small, yet pack an enormous diversity of different molecules such as DNA, mRNA and proteins. Chemists from Radboud University Nijmegen, Eindhoven and Paris now show for the first time that random variations or 'noise' in cellular processes come to exist because of an interplay between the rate of the reaction and its environment. Nature Nanotechnology publishes the results on October 26. In a living cell, many processes are continuously going on at the same time. Because of that, many different components are present in minute quantities, which inevitably leads to random variations in cellular processes which are also called 'noise' by chemists. Until now, the exact origin of the noise had never been fully explained. Maike Hansen, chemist at Radboud University and first author of the article, explains: 'To investigate the noise phenomenon, we placed DNA molecules in hundreds of tiny picolitre fluid droplets.' 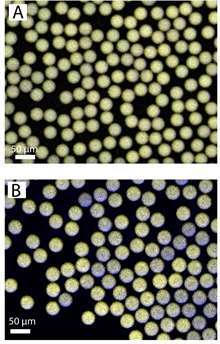 All the droplets had the exact same composition, allowing the researchers to investigate them at the same time and look at the noise that originated from the small variations between them.